If you are a AT&T customer, we are pretty sure you are well aware that MMS has finally been activated on our IPhones. Well... for most of us that is. Some of you are still having issues getting it working. Stop by the official AT&T MMS threadand let us know how your experience has been so far. This next thread was started by DBlanco and he thinks the iPhone is a perfect device. While many of you would agree with this there's an equal amount of you who would disagree. Stop by the thread for yourself and speak your mind. My feeling is, yes the iPhone is a great device but no single device is 100% perfect. There is always room for improvement. This thread was a started a while back by Erika78 and she wants to know why you decided to leave your previous phone and make the jump to iPhone? With our forums growing by the day this is one of those threads that will never die. Join in on the conversation and let us know why you left your old device. Have some iPhone tips and tricks that you'd like to share? Perhaps you are in need of some general help? This is the forum you need to visit. 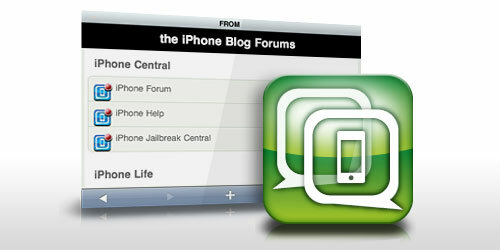 That is the place to find answers to your iPhone questions along with all the tips and tricks you can imagine.